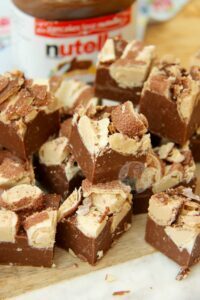 Chocolate Hazlenut Nutella Fudge – So easy and simple to make, and so moreish – you will want to make it again and again! 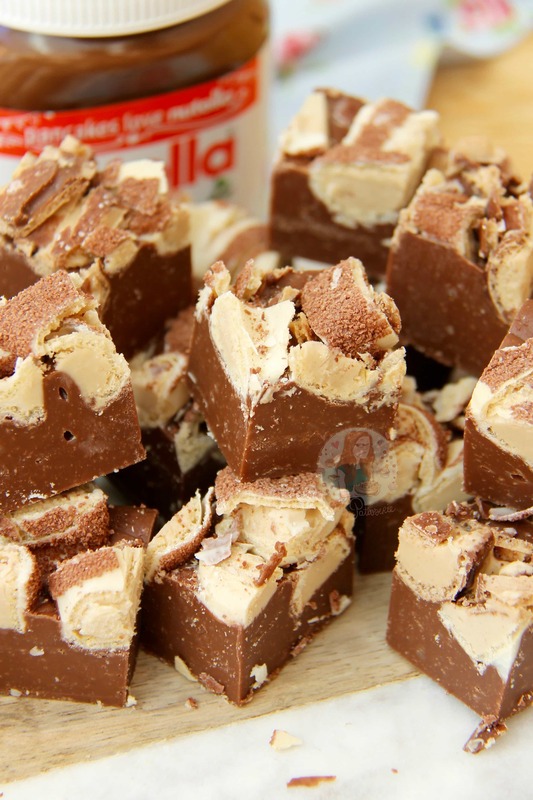 So the last time I posted a Fudge recipe I said I wouldn’t do one for a while… Well this is as long as I could last. Sorry! I mean I just can’t resist… it’s so addictive! Something that is so simple, chocolatey, nutty, and creamy is my absolute heaven and I adore it. This recipe is similar to my Triple Chocolate Cookies Fudge as the base of the fudge is Condensed Milk rather than Clotted Cream like all of my other recipes! I like this type of fudge as its basically a store cupboard fudge, other than a dab of butter, but I always have butter in the house! I changed it up a bit and made it similar to my Speculoos/Biscoff Cookie Butter Fudge in a sense that I use a spread in the mixture. This meant I reduced the chocolate from 400g to 300g, but still used 300g of Spread. I figured as its a spread I could use more then the 100g weight difference, and I was right. This fudge set so well I was astounded! I found the Carnation recipe for their easy chocolate fudge but I wanted to elevate it to a new level and involve something that will catch the eyes of people, and excite the tastebuds… the answer? NUTELLA. Always and forever, Nutella. Seriously, it surprised me how little I had to adapt the Triple Chocolate Cookies Fudge recipe to involve the nutella flavour and get it strong enough for people to notice, and my god it worked so well! This recipe is all mixed in one pan so there is no faffing about, no boiling to 116C+, and is so easy you will want to make it over and over. I am not joking, I have made this for Bake Sales for Charity, and I didn’t do nearly enough! I swap between using some Ferrero Rocher in the Fudge, and Kinder Bueno (As they’re made by the same company!) and both work so so well! I know that if you’re a Nutella lover, you will LOVE this! Enjoy! – Chopped up Ferrero Rocher/Kinder Bueno – Optional! 1) Line a tin with parchment paper – I use a 7×10″ brownie tray as it makes a nice depth of fudge. 2) Put the chopped chocolate into a heavy based pan, along with all of the condensed milk, Nutella, and butter – melt on a low heat, stiring often so that the chocolate doesn’t just get stuck on the bottom and burn! 3) Once melted, transfer to a large bowl! Tip in the icing sugar and combine well – it make take a bit of beating but its totally worth it! 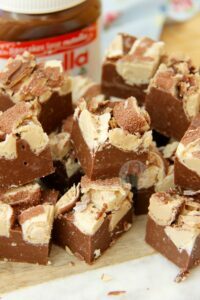 Pour into the tin – smooth over the mixture and sprinkle on top the Ferrero Rocher or Kinder Bueno, and push into the fudge! Store in the fridge for 4-5 hours, or preferably over night to set! 4) After at least 4-5 hours, remove from the tin and cut into the squares, return to the fridge for another couple of hours to finish setting if its still a little soft v– ENJOY! This recipe will last better in the fridge for up to two weeks if it manages to last that long – you can also easily half or double the recipe, the setting times will just change slightly. I used Callebaut Milk Chocolate as its what I ALWAYS have in my cupboard, but any good quality milk chocolate will work well! 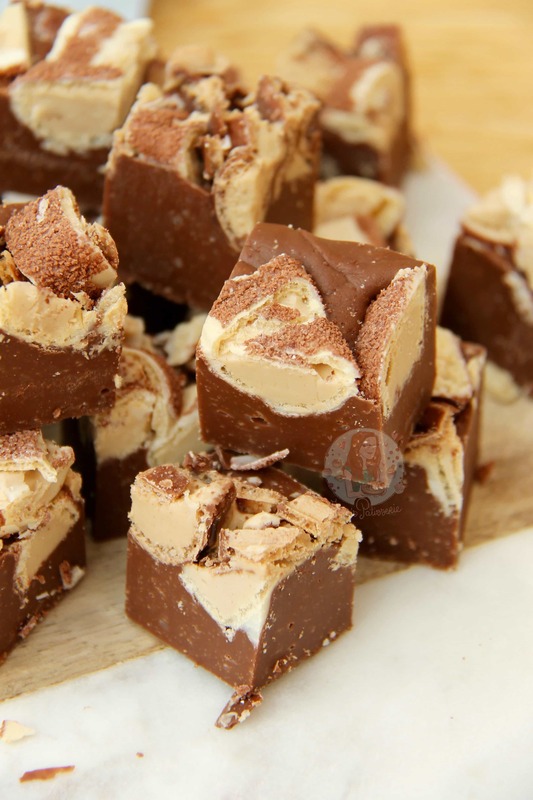 I used Kinder Bueno in my recipe video for this fudge, but I often use Ferrero Rocher as well! Both are Nutellaish based chocolates anyway, so either will work! Obviously – it would work well without as well! P.s. Welcome to the Nutella Fudge Addiction. 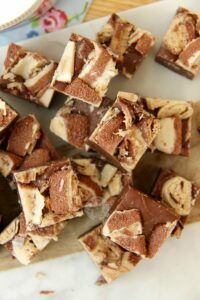 Find my other Fudge Recipes on my Recipes Page! Older Next post: Sticky Chocolate Sweet Rolls! Newer Previous post: Lemon and Poppyseed Bundt Cake! I tried it today, and taste absolutely amazing!! 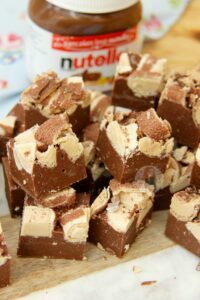 Such an easy inexpensive recipe, will definitely be trying out your other flavours of fudge to make! i tried making this last night but it hasn’t set in the fridge well at all, what have i done wrong :(? Could it be made with dark chocolate? Do you use sweetened or unsweetened condensed milk? Ours doesn’t specify if its sweetened or not, so I’m not too sure. Ours tastes sweet but to be honest I’m not sure… as long as they’re similar in thickness and such it’s worth a try. I made this today but used Toblerone and datk chocolate instead! Wow!!! Blogged it and tagged you! ?????? Thanks to your brilliant inspiration ???? Yes, yes, yesssss… need this now! You had me at fudge. and nutella. and ferrero rocher. Pretty much I was sold from the beginning! Totally pinning this to try over the holidays. If I can wait that long. Hahaha good luck with waiting 😉 thank you!!! 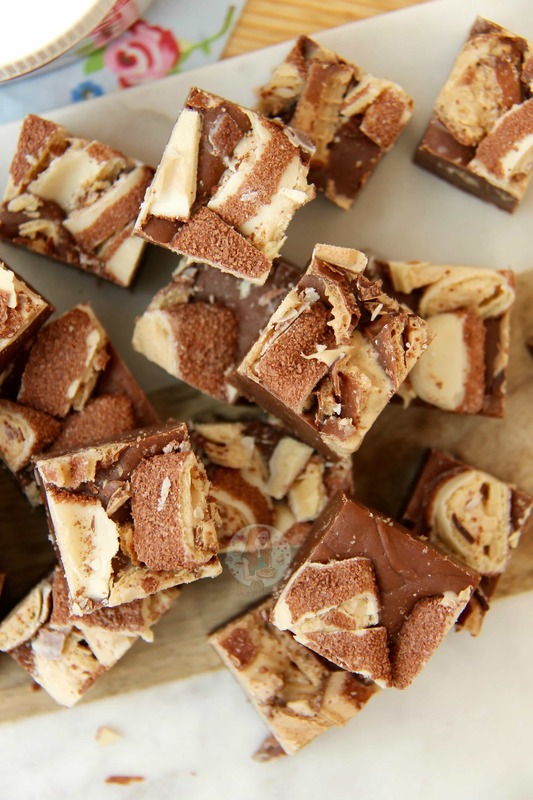 I’ve never made fudge – but definitely going to try now! This recipe looks amazing! Looks amazing, I would not be able to stop eating it! Hahaha yes, I corrected my title! And it’s so much easier and less faffy when In one pan haha I love it! Thank you!